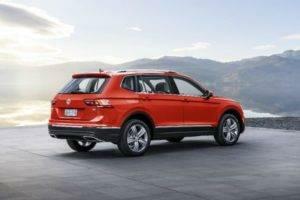 At the Detroit Auto Show, Volkswagen unveiled a brand-new, stretched out version of their popular Tiguan. 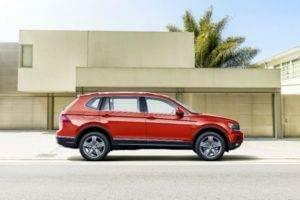 The compact SUV has been extended to fit on the same platform as the all-new three-row Atlas, and the results are a much longer Tiguan with more space for cargo and seats for as many as seven. To give you a good idea about what the long wheelbase Tiguan has to offer, let’s take a closer look at the specs and features that set it apart from the standard SUV. All told, the longer-wheelbase Tiguan measures 185.2 inches long, which makes the extended version 10.7 inches longer than previous versions of the Tiguan. Though a couple of inches may not seem to make much of a difference, it actually gives the SUV an increase in cargo capacity of 57 percent. As we hinted to earlier, it is also enough space to squeeze in a third row of seats. The announcement of the long wheelbase Tiguan is particularly interesting, as there has never been a three-row, seven-passenger SUV in the Volkswagen lineup here in America. Late last year it was made known that the aforementioned Atlas would be the first, but we had no idea that there would be not one, but two seven-passenger SUVs coming in the same model year. 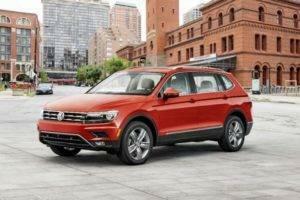 As of right now, there has not been any talk of the price of the larger Tiguan, but as you can see from the quote above, it’s clear that Volkswagen will not be jacking up the price, but rather will be pricing it to compete with some of its biggest competitors in the segment, such as the Toyota RAV4 and the Ford Escape to name just two. The release date also has yet to be announced. 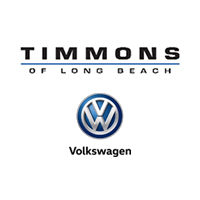 For more information on the long wheelbase Tiguan, including its MSRP and the date that you can expect to find it in showrooms across the nation, we encourage you to check back here on the Timmons Volkswagen blog. You can also go right ahead and follow us on Facebook to make sure that you don’t miss any updates. We’ll be sure to let you know as soon as we get this one on our lot so that you can see for yourself what a Tiguan with three rows looks like.